A couple of years ago, we had the pleasure (well, I thought it was a pleasure) of reviewing Financial Accounting by Professor in a Box. Although Connor was capable of doing the math involved, he was not quite ready for the business thinking. Because of my accounting background, though, I was able to review this excellent product anyway. We were excited for the chance for him to get a chance to explore marketing concepts, especially those related to consumer behavior or to finding a niche, and those related to pricing, promotions, and sales. Point being: we were really looking forward to this course. The first thing we thought when we received Professor in a Box: Principles of Marketing was... "Where's the box?" Financial Accounting did come in a box, but our marketing was just a disk in a sleeve. Popping it into the computer, however, we found all the stuff we I loved about Accounting. A well laid-out lesson plan, materials that treat you like a responsible person, and a very collegiate feel. And it is something that I don't have to teach or prepare or anything. And it prepares the student for the Marketing CLEP. The collegiate feel would make sense, as the "professor" in the company's title really does mean professor. In this case, Julie Pirsch, Ph.D. 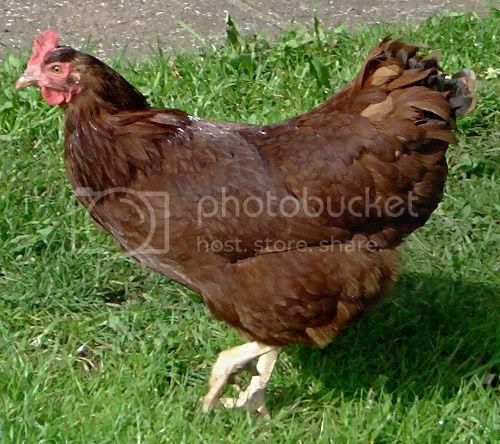 The lesson plan consists of 28 total lessons. Suggestions are to do one lesson a week for a full-year course, or two lessons a week for a semester. Another suggestion is to do three lessons per week for a "summer session" pace. We opted for the semester option, so at this point, Connor has just finished up lesson 9, which is the first test. I let him take the rest of the week off, though, so he'll start the next chapter next week. reviewing online resources on the Professor in a Box website (20 minutes suggested). This includes a website talking about high-fructose corn syrup, a Harley-Davidson Owners website, a fan site for a band (Phish), and a Frontline series on consumer behavior. We spend way longer on this than the lesson plans suggest. Those two lessons are fairly typical. The lectures range from 20-35 minutes. There are online resources for all of the chapters. We loved that part. It makes it so much more REAL. I wish my marketing class had included such incredible examples. Though I have to admit that I laughed to see McDonald's and FedEx on the Resource list, as we did study both of them. Much different stuff, but I definitely remember them both. The really great thing about reviewing this course? Connor told me that maybe after he gets through this he'd like to try Financial Accounting again. I think he's ready for it now, so we will probably be doing that. 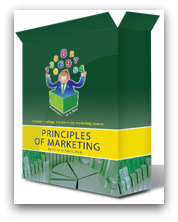 Principles of Marketing is designed as a high school level course, intended for a high school level student with basic reading and math skills. I would concur. I have not viewed the entire course for myself, but from what I have seen this is at least as comprehensive as my Intro Marketing course in college, and it appears to me that learning the material presented here will be excellent preparation for the Marketing CLEP. Hopefully, I'll remember to come back here and post an update in January as to whether or not that was true. Why should you consider this marketing course as a high school elective? Marketing principles are a good thing for *everyone* to know. Because everyone is going to have to market themselves at some point, even if nothing else. And because of our market-driven culture... understanding basic marketing concepts can be a big help when you are a consumer. You don't have to prepare *anything* for this course. Just have an available computer, and probably some paper and a pencil. It is *so* easy on mom. The CLEP test can serve as something to "back up" your child's transcript. Something independent showing he really did learn something. It is a little unusual, and unusual can be a good thing. This is not a "hard" course, but it is a very good course. It introduces your student to a typical college class style, which is great for the college-bound, but good for the non-college bound child as well. The CLEP test can mean college credit. At $119.99 (with free shipping), this non-consumable course isn't cheap, but I'd say it is a bargain, even for one student. Even morseso if you have more than one child who can use it. Disclaimer: As part of the TOS Homeschool Review Crew, I did receive Principles of Marketing in exchange for my review of the product. All opinions are my own, and receiving complimentary products does not factor in to my opinions. For more about my take on reviews, visit my blog post here. Sounds like we would like this in a few years. Great comprehensive review of what you did! I'll have to consider this in a few years!